Physical Description: Small, athletic frame. Very strong for his size. Some physical projection remaining, especially in his lower half, but will always be on the thin side. Doesn’t have a frame that will add significant weight as he matures. Hit: Compact, level swing. Fluid load. Quick hands and strong wrists. Plus-plus bat speed. Solid overall approach for someone his age; works counts and isn’t overly aggressive. Consistently makes solid contact to all fields. Plus strike zone judgment. Potential plus-to-better hit tool. Power: Average-to-better power potential. Potential to hit 15-20 home runs per season. Power comes from lightning-quick hands and bat speed. Surprising pop for someone his size. Can drive the ball to all fields. Field: Potential plus defender even though he didn’t convert to outfield until May 2014. Gets solid reads and good jumps. Doesn’t always take the best route, but able to recover due to his speed. Plus range; able to go get the ball in the gap. In the infield, showed fluid and smooth actions defensively. Soft hands. At times, tended to stay back on balls rather than charge. Excellent instincts and could profile as a plus defender at second base as well if given the chance to play there. Run: Plus-to-better speed. Excellent instincts on the basepaths. Ability to impact a game with his legs. Career Notes: Committed to play at Tennessee prior to signing. Excelled in four sports in high school including basketball and bowling. Started his career in Lowell at shortstop before moving to second base, where he looked much more comfortable. 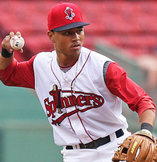 Began to play in the outfield in May 2014 when it became clear he would be in Boston by the end of the season. Began 2014 season with a 66-game on-base streak (71 including prior season's playoffs). Selected for the 2014 Futures Game, but did not participate due to MLB call-up. Nephew of former MLB 2B Terry Shumpert. Summation: Potential role 7 player; frequent all-star, impact player. Top-of-the-order profile with potential to hit .300 with 15+ home runs and 30+ steals in his peak with plus defense in either the outfield or at second base. One of the top young players in all of baseball. Elite makeup and work ethic. Gets the most of out of what he has and never takes a play off. Franchise cornerstone type of player.